On August 24th 2006 the word "planet" was given its first-ever scientific definition by a vote of the International Astronomical Union. With the raising of a few yellow cards in Prague, Pluto was demoted from full-fledged planet to "dwarf planet." 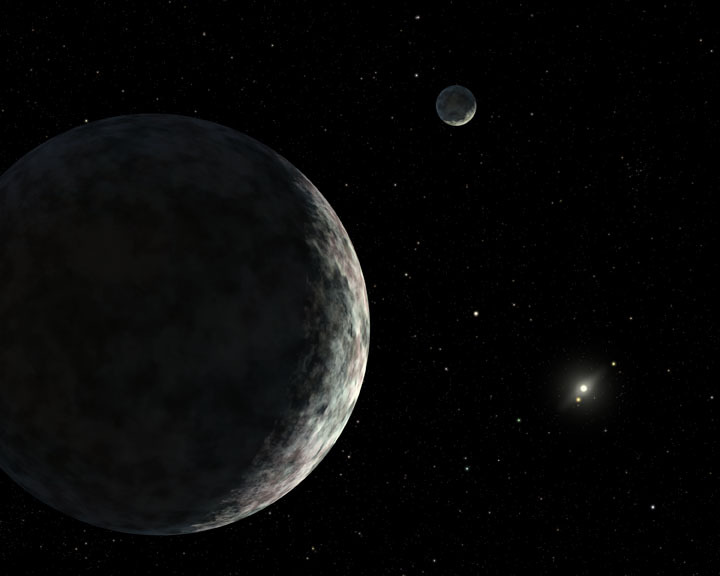 Eris, originally called 2003 UB313, sometimes called Xena, sometimes called the "10th planet," which in many ways precipitated this final debate, becomes the largest known dwarf planet. Unless astronomers revisit this issue at some point in the future, it is unlikely that there will ever be more than eight planets. While some still continue to mourn the loss of Pluto from the pantheon of planets, it is much more interesting to consider this new class of dwarf planets, instead. When the final vote on the definition of "planet" was made, and the eight dominant bodies in the solar system were declared (quite rationally) a class separate from the others, a new class of objects was defined. The "dwarf planets" are all of those objects which are not one of the eight dominant bodies (Mercury through Neptune) yet still, at least in one way, resemble a planet. The best definition heard so far is that a dwarf planet is something that looks like a planet, but is not a planet. The dwarf planets are bodies in the solar system which are large enough to become round due to their own gravitational attraction. Why do astronomers care about round? If you place a boulder in space it will just stay whatever irregular shape it is. If you add more boulders to it you can still have an irregular pile. But if you add enough boulders to the pile they will eventually pull themselves into a round shape. This transition from irregularly shaped to round objects is important in the solar system, and, in some ways, marks the transition from an object without and with interesting geological and planetary processes occuring (there are many many other transitions that are equally important, however, a fact that tends to be ignored in these discussions). There are two ways to look at this question. First is to ask: acording to the official list kept by the IAU, how many dwarf planets are there? The current answer (as of 1 April 2007) is only three. The asteroid Ceres is the only asteroid known to be round. Pluto is also considered a dwarf planet. And Eris, a little larger than Pluto, is a dwarf planet also. Three is all the IAU will currently deal with. Reality, however, does not pay much attention to official lists kept by the IAU or by anyone else. A more interesting question to ask is: how many round objects are there in the solar system that are not planets? These are, by the definition, dwarf planets, whether or not they ever make it to any offiicially sanctioned list. If the category of dwarf planet is important, then it is the reality that is important, not the official list. While we can't see most of the objects in the Kuiper belt well enough to determine whether they are round or not, we can estimate how big an object has to be before it becomes round and therefore how many objects in the Kuiper belt are likely round. In the asteroid belt Ceres, with a diameter of 900 km, is the only object large enough to be round, so somewhere around 900 km is a good cutoff for rocky bodies like asteroids. Kuiper belt objects have a lot of ice in their interiors, though. Ice is not as hard as rock, so it less easily withstands the force of gravity, and it takes less force to make an ice ball round. The best estimate for how big an icy body needs to be to become round comes from looking at icy satellites of the giant planets. The smallest body that is generally round is Saturn's satellite Mimas, which has a diameter of about 400 km. Several satellites which have diameters around 200 km are not round. So somewhere between 200 and 400 km an icy body becomes round. Objects with more ice will become round at smaller sizes while those with less rock might be bigger. We will take 400 km as a reasonable lower limit and assume that anything larger than 400 km in the Kuiper belt is round, and thus a dwarf planet. How many objects larger than 400 km are there in the Kuiper belt? We can't answer this question precisely, because we don't know the sizes of more than a handful of Kuiper belt objects (for an explanation why, see the discussion on the size of Eris), but, again, we can make a reasonable guess. If we assume that the typical small Kuiper belt object reflects 10% of the sunlight that hits its surface we know how bright a 400 km object would be in the Kuiper belt. As of late August 2006, 44 objects this size or larger in the Kuiper belt (including, of course, Eris and Pluto), and one (Sedna) in the region beyond the Kuiper belt. In addition our large ongoing Palomar survey has detected approximately 30 more objects of this size which are currently undergoing detailed study. We have not yet completed our survey of the Kuiper belt. Our best estimate is that a complete survey of the Kuiper belt would double this number. For now, the number of known objects in the solar system which are likely to be round is 53, with the number jumping to 80 when the objects from our survey are announced, and to ~200 when the Kuiper belt is fully surveyed. Beyond the Kuiper belt there may be even more dwarf planets than in the Kuiper belt. Our best guess is that the region where Sedna resides could contain another ~2000 dwarf planets. What does the new solar system look like? Who has discovered dwarf planets?